James Stuart Bell, with Patrick J. Kelly, Awakening Faith: Daily Devotions from the Early Church. Grand Rapids, MI: Zondervan, 2013. $18.68 (Amazon). 400 pp. The average American evangelical knows little of church history. I am certainly no expert in this area, but I do feel the need and desire to be acquainted with the community of faith that spans the past two thousand years. For that reason, it is always a pleasure for me to read about the early church or read the words of the Church Fathers themselves. 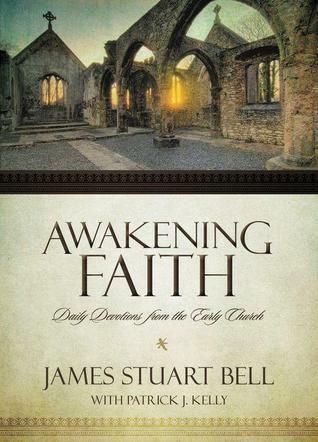 Therefore, I’m delighted to let you know about Awakening Faith by James Stuart Bell and Patrick J. Kelly. This new year-long devotional provides a simple, bite-size introduction to a number of spiritual giants in church history. What’s intimidating about the early church writers is that their writing is heavy. There’s teeth to it. Reading the early church is not like picking up the latest Christian best seller at Barnes and Noble. These writers make you think because they are (1) not American and (2) lived outside our century. These two things make reading the early church valuable. Yet you do not need to be intimated because in Awakening Faith you’ll get rich doctrine and wholehearted devotion in small bites. Each day has a simple layout. There is an introductory verse or two from Scripture followed by a few paragraphs from an early church pastor or theologian. There is a consistent focus on Christ, the gospel, spiritual formation, and the duty of Christians to be salt and light in the world–everything a good devotional should be. Bell pens a helpful introduction to why the early church matters. Another particularly nice feature is the index of authors. The index provides the list of authors, which days contain their writings, and a short bio of their contribution in church history. I have one critique that is really a suggestion for future editions: I would like to know the source of each devotional. That would no doubt help curious readers who want to dig deeper into any particular author. In the end, I’m excited about this devotional. My caution when considering any devotional is to remind people not to let it replace regular Scripture reading. At the same time, if you are looking for a solid Christ-centered devotional as a complement to your personal worship in the word or if you want to introduce yourself to the early church, I would highly recommend Awakening Faith!